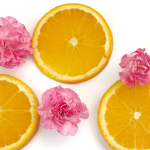 Soft pink and white rose petals grace the walls. 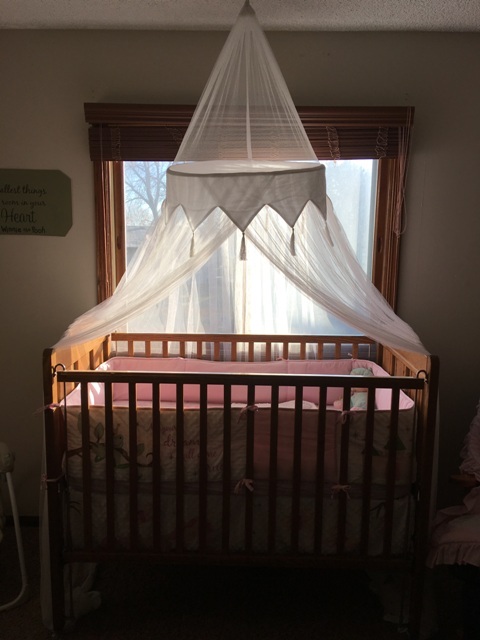 Princesses and castles dance along the crib sheets while the mobile spins round and round. 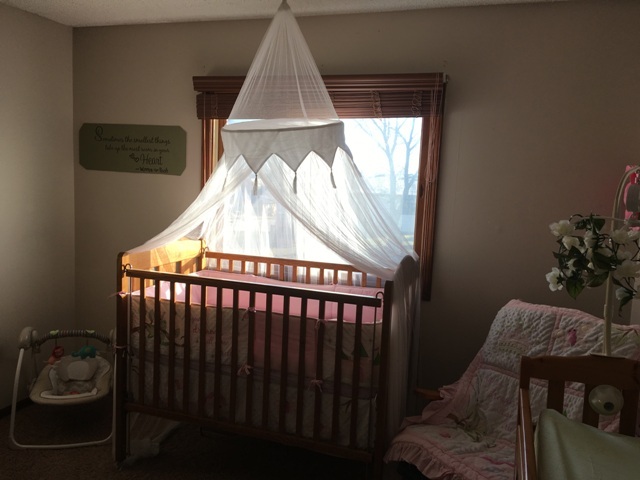 A soft lullaby fills the room while the rocking chair sits patiently in the corner. The whole room waits in silent anticipation, holding its breath for that first newborn cry to fill the air. 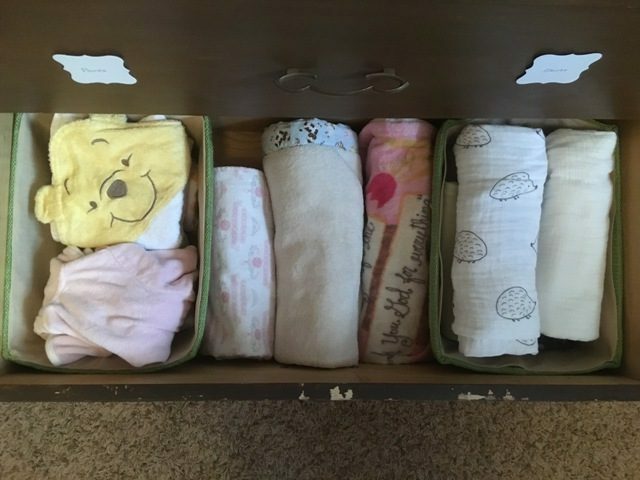 Soon tiny hands will grasp the cozy plush blankets, tiny feet will kick back and forth on the changing table cushion. She is coming, any day now, it’s just a question of when. Whenever she comes, the room will be ready and so will we. 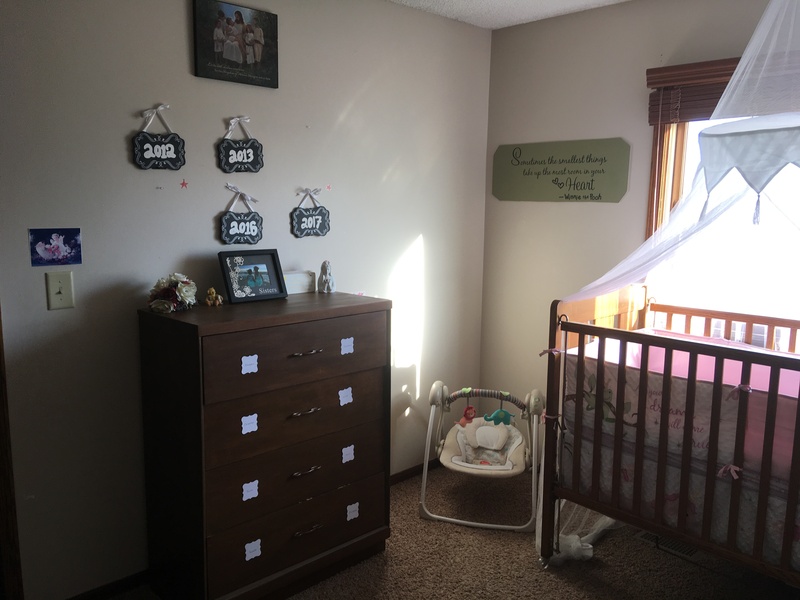 Here we are at 39 weeks and I’m finally able to post the princess nursery reveal! It’s been a labor of love, preparing this room for the past months. 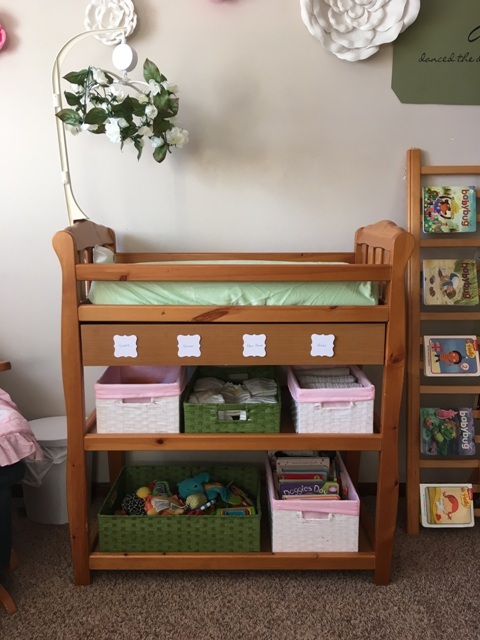 Bringing out the hand me down furniture and accessories from our older daughter’s outgrown nursery storage. Having the excited big sisters help me fold the tiny mounds of clothes and organize the colorful toys. 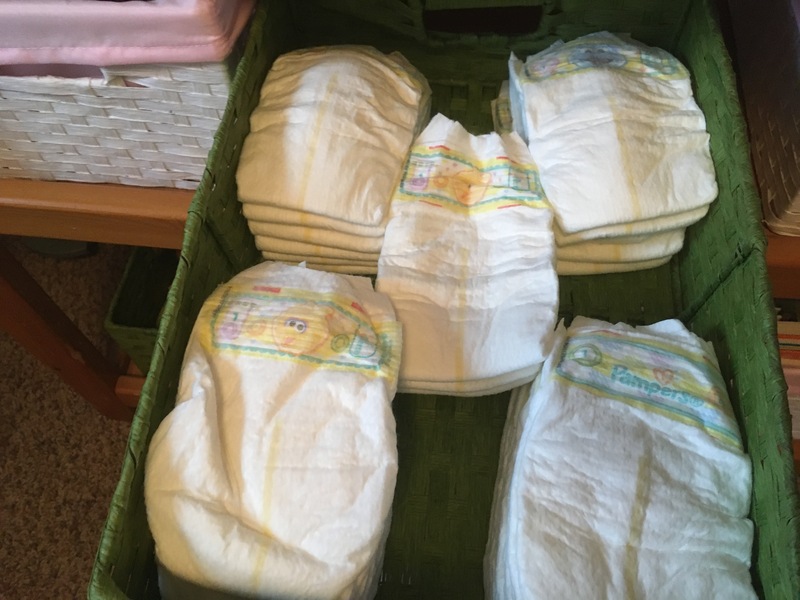 Stocking up on newborn diapers and fresh baby wipes. Choose and purchasing some new items for this little one to call her very own. Now we are all ready to welcome this new lovely little one to our family! 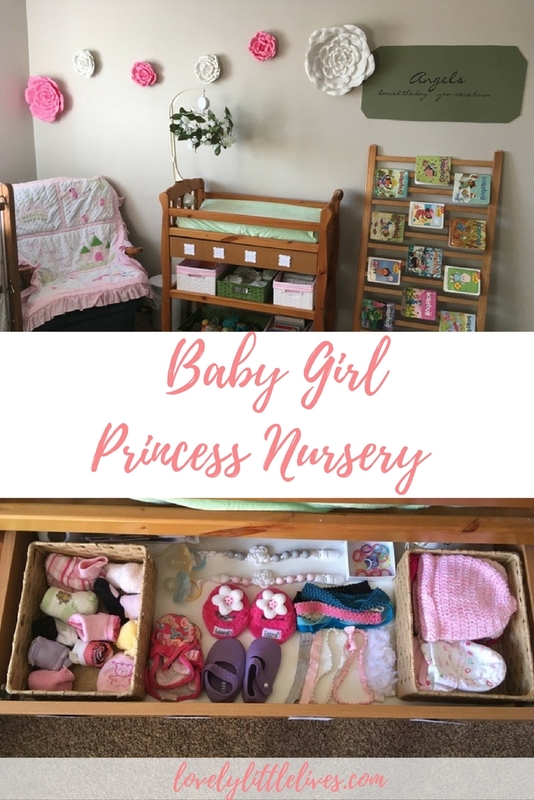 Watch the live tour of the nursery here. The theme for the room is princesses and roses with pink, green and white accent colors. 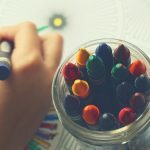 You could choose any theme you like for your nursery and still use my organization tips and many of the baby products I’ve listed. 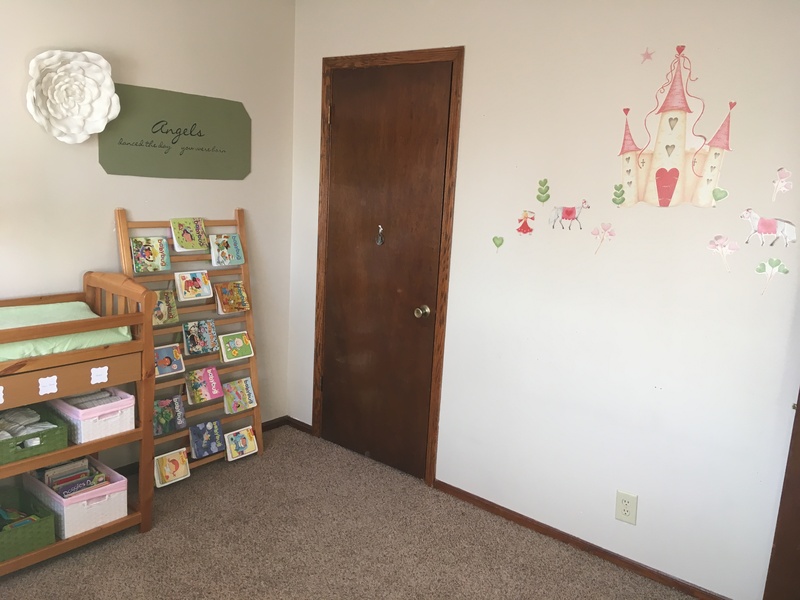 Below are pictures of the room and the product links to the items inside. 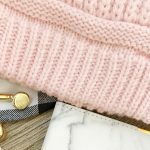 Note that some of these links are actual items I’ve recently bought and others are links to similar products if I couldn’t find the exact same item. Since I buy secondhand when I can, I couldn’t find exact matches for everything. 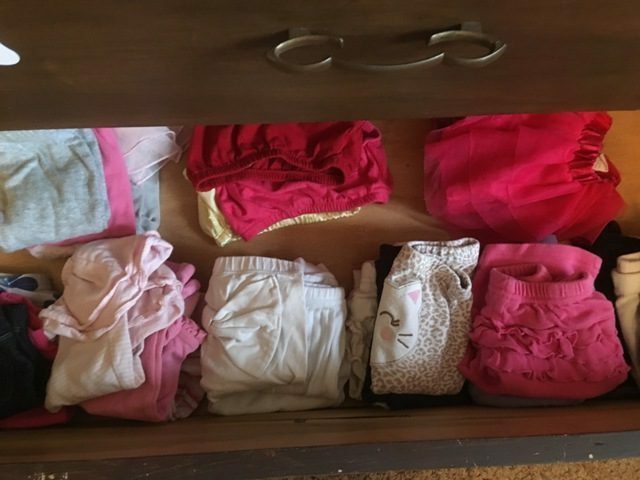 I included an inside peek into the dresser drawers, changing table and closet so you can see how I organized all the baby accessories. 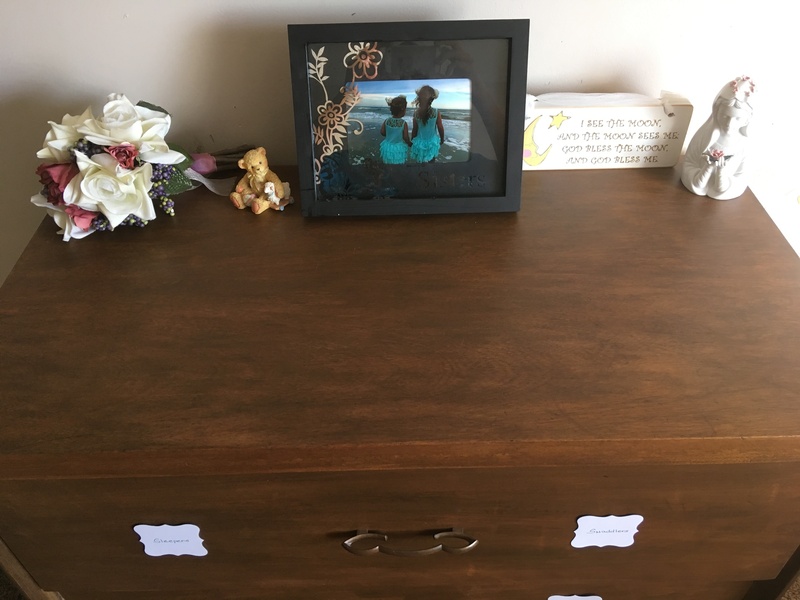 Pro Tip: The Angel decal and Winnie the Pooh decal were applied to heavy green cardstock that I purchased and cut from Hobby Lobby. 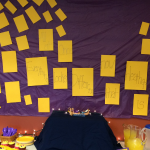 They are applied to the wall with study picture command strips. I love having them on the cardstock because I can reuse and re-arrange the decals for each baby without the sticky part wearing out. 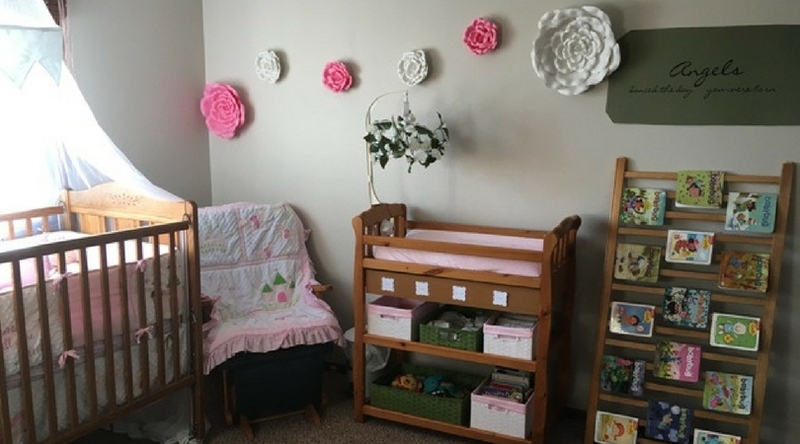 Pro Tip: I removed the hanging toys from the crib mobile I had and applied a white rose garland instead. I just wrapped it around and hooked the greenery in the mobile hooks. 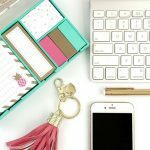 You can buy http://amzn.to/2jydgvMone without any toys and add whatever accessories you would like. 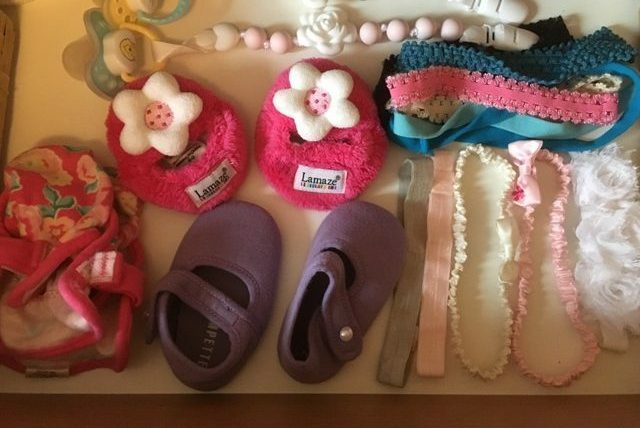 The little beige baskets are from Hobby Lobby as of five years ago and I had a little white gift box on hand that I used to hold the baby hair ties. The rose themed pacifier clips also double as silicone teethers so I’m really excited about those. I will have one in my diaper bag and leave the other in the baby room. 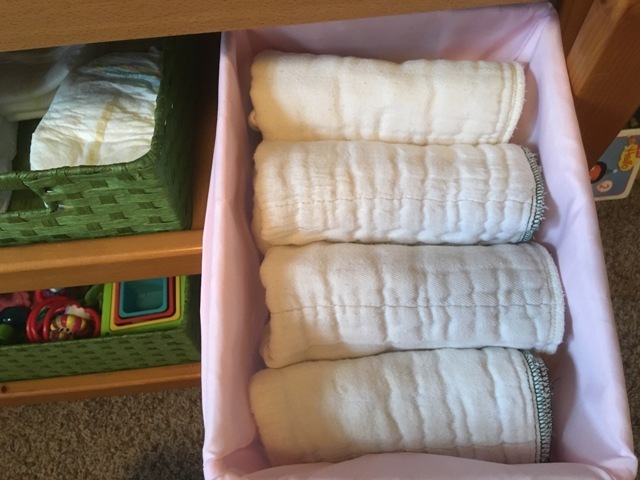 Baskets on the first shelf of the changing table: first basket has wipes, washcloths, and samples from my Amazon registry welcome box, second basket has diapers, third basket has cloth diapers to use as burp rags. 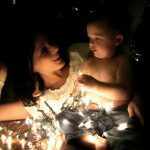 Note: If you are pregnant, you might want to check out the Amazon baby registry. 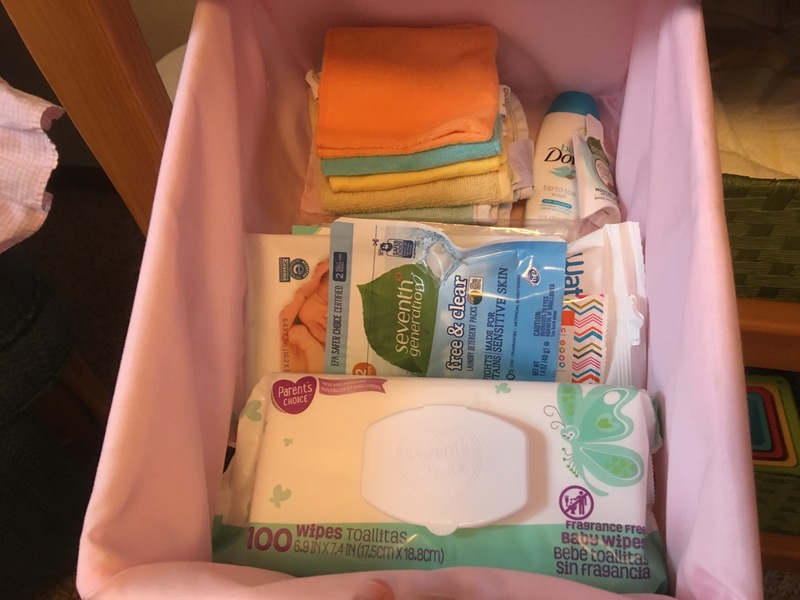 I signed up for one for the first time and have been enjoying the perks and discounts that come with it including a baby welcome box! Related Video: You can watch me open my welcome box in this video. 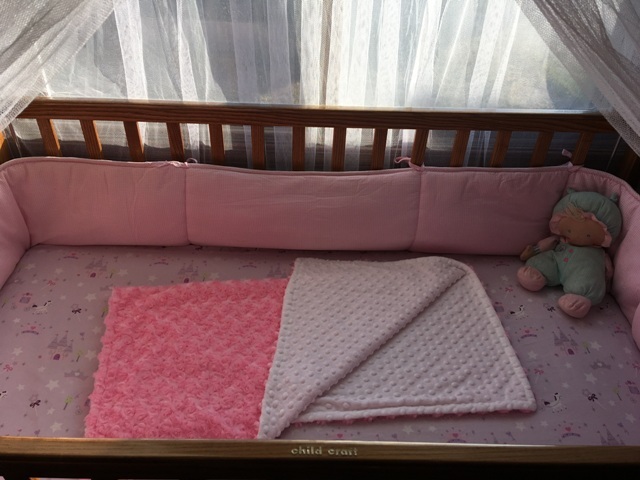 I made this out of a recycled crib rail from our previous crib. 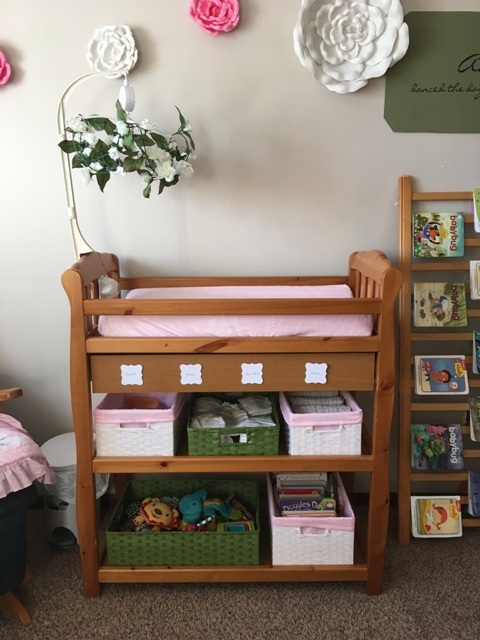 It was a second-hand crib that broke after our older daughter was done with it and so I repurposed the rail to be this standing magazine rack. 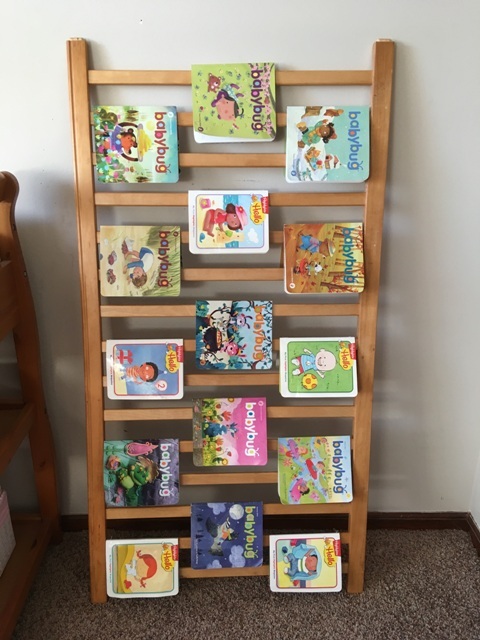 These are subscription magazines that my mom buys for the grandkids so we have accumulated a lot of them and they work great to hang over the rack. 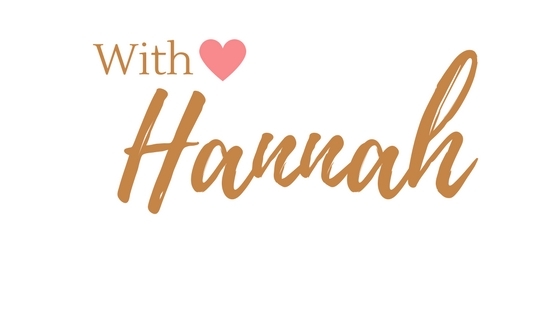 If you are interested in these cute little baby magazines you can find them on Amazon magazine subscriptions: Baby Bug and Highlights Hello. 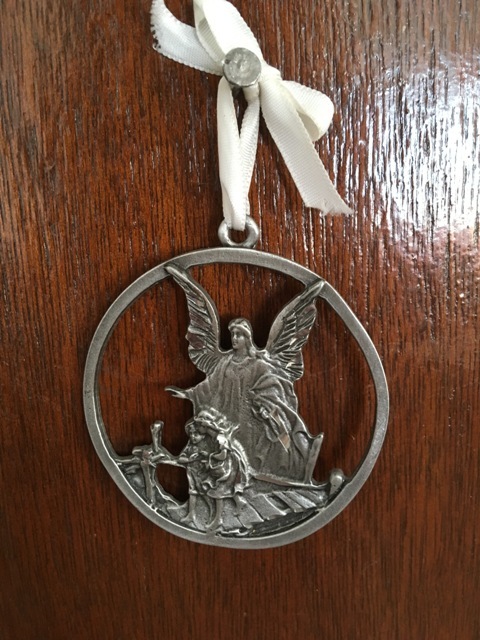 Guardian Angel Crib Medal is hung on the back of the closet door. 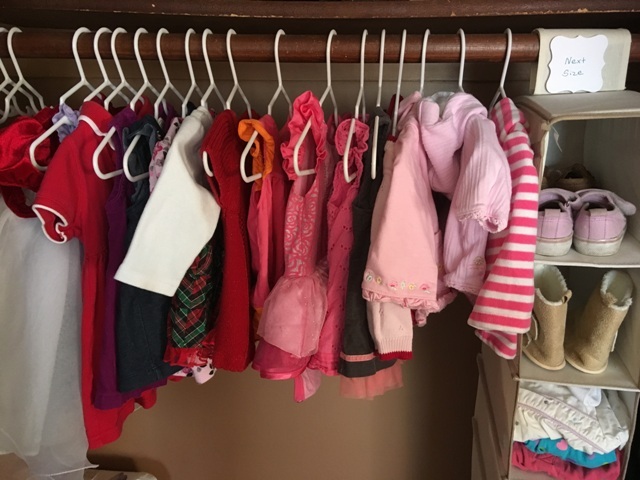 Closet rung has baby dresses and jackets arranged on nursery hangers, hooks for my baby sling and baby carrier, and a hanging closet organizer filled with the next size of clothing (6 to 12 months). I will be switching these out as needed so I always have outfits ready for those transition growth spurt days. 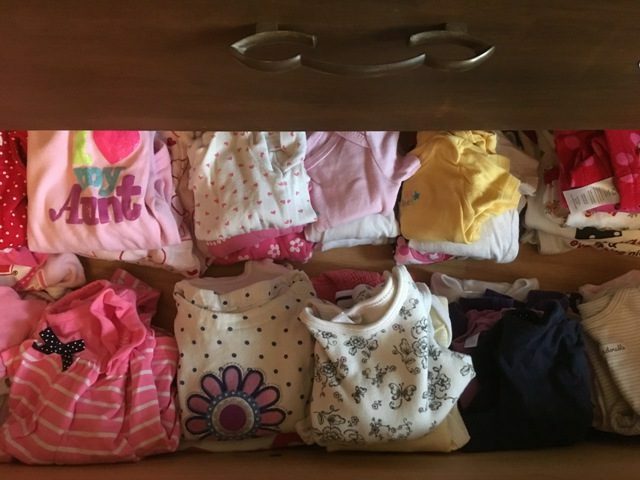 When it’s time, these clothes will be moved to the baby’s dresser and then replaced with the next size up. Watch the video where I open the Amazon baby registry welcome box here. 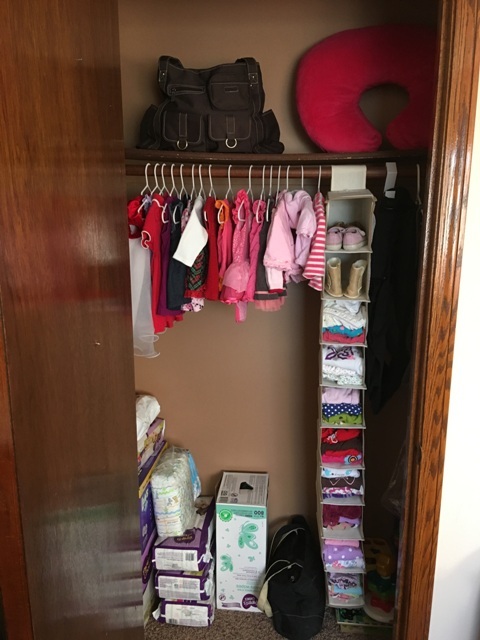 Closet shelf holds my diaper bag and boppy nursing pillow. I couldn’t find the hot pink cover to link to but I found this really sweet fairytale boppy cover instead. Our diaper stock from the diaper shower we had earlier this fall with sizes newborn through size three is in one corner of the closet, more toys for when the baby gets older are in the other corner. My Medela Freestyle Nursing Pump is organized inside the black bag in the middle of the closet floor. 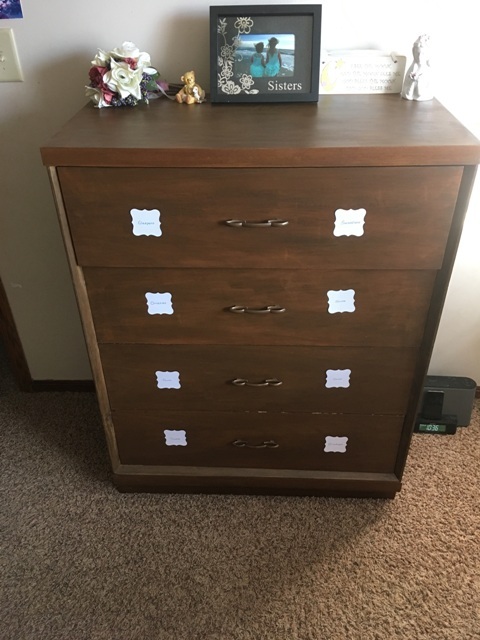 Brown Dresser with white labels to tag the inside contents of each drawer. 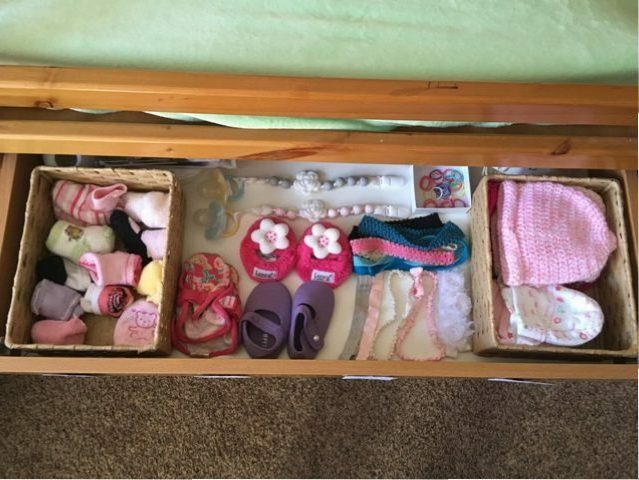 The top drawer labels say sleepers and swaddlers, the second drawer labels say onesies and shirts, the third drawer labels says pants and skirts, the bottom drawer labels say towels and blankets. The diaper bag and car seat are all packed and ready to go. In the diaper bag, I have diapers, a few baby outfits and wipes in my princess travel wipes case. 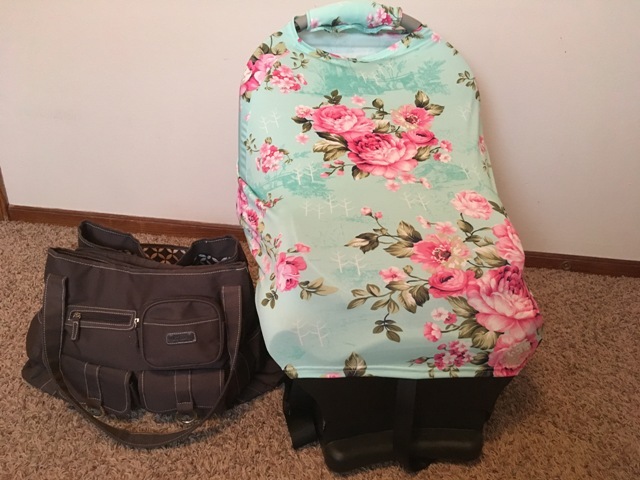 The car seat has a car seat cover that can also be used as a nursing cover. It came as a set with a matching baby hat and a car seat handle cover. It’s one of my new favorite baby purchases! 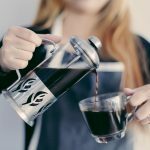 If you have any questions about anything in this post, please comment below. 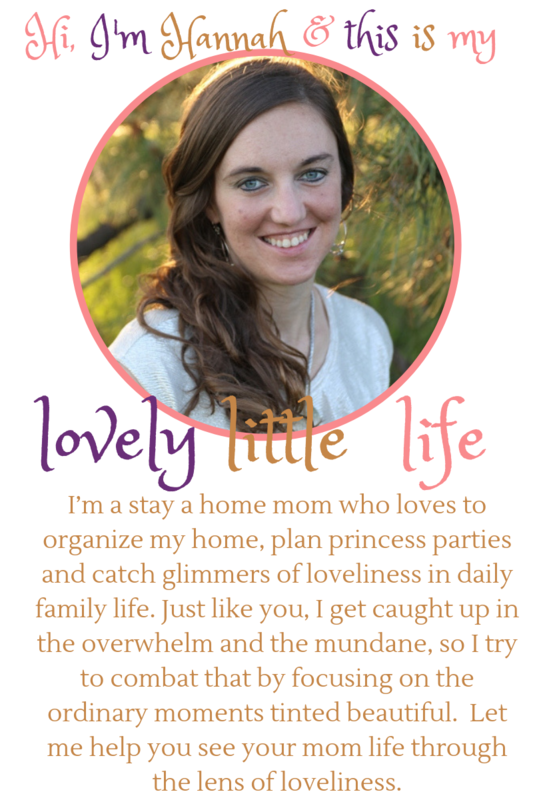 I would love to hear how you have decorated and organized your baby nursery. 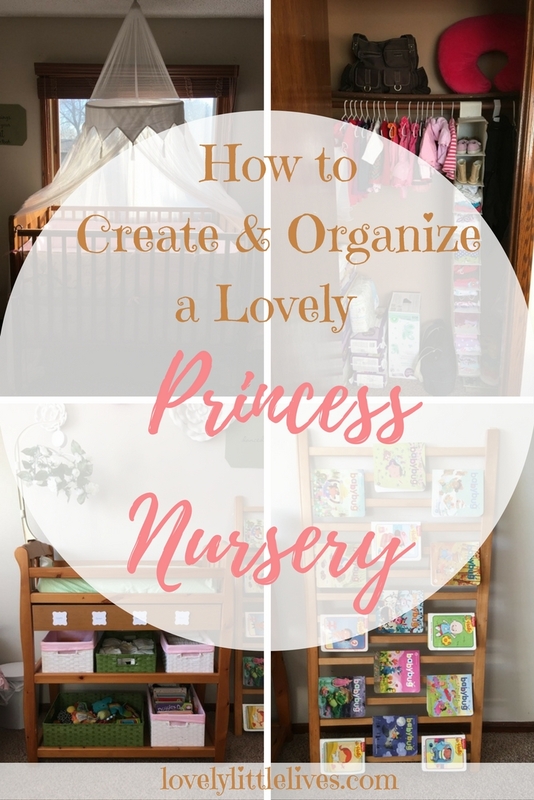 If you haven’t had a chance yet, you can watch the live tour of the nursery here.